Does Mary Appear in the Night Sky this Feast of the Annunciation? The sky will be spectacular in the west after sunset on March 25, 2012, with the waxing crescent moon and the planet Jupiter very close to each other in the evening twilight sky. Plus Venus is nearby – the sky’s brightest planet. You’ll see Jupiter and the moon below Venus in the west after sunset. The famous Pleiades star cluster is above Venus. 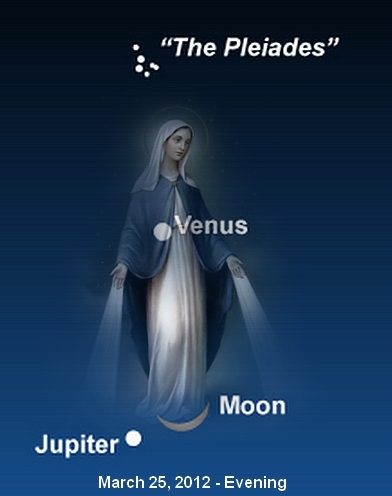 For centuries Mary has been referred to as the “Morning Star”, the popular name of the Planet Venus. In this configuration, the Morning Star appears with the moon at her feet. The Pleiades (from “peleiades” the Greek word for doves) overshadows the Morning Star. Jupiter, the “King Planet” approaches the configuration. The symbolism is striking. This is a interesting arrangement for the mystery of the Annunciation which heralds Christ’s coming through Mary. The Holy Spirit will come upon you, and the power of the Highest will overshadow you; therefore, also, that Holy One who is to be born will be called the Son of God. (Luke 1:35).